E-commerce is the buying and selling of products and services, or the transmitting of funds or associated data, over the Internet. These business transactions occur either business-to-business, business-to-consumer, consumer-to-consumer or consumer-to-business. It is estimated that there are about 20 million e-commerce stores selling products on the internet around the world today, and generating more than one trillion US dollars in revenue. The world’s largest markets for e-commerce are the United States of America, China, and the United Kingdom with electronics, fashion, services, books, and tickets being the top categories for e-commerce. The details, however, do vary greatly by country and my product category. The primary advantages of ecommerce revolve around the fact that it eliminates limitations of time and geographical distance. In the process, ecommerce usually streamlines operations and helps to achieve lower costs. E-commerce is simply huge and it is projected that e-commerce spending will grow at double digit rates for the foreseeable future. Consumers increasingly rely on e-commerce, irrespective of how they make the actual purchase: via clicks, bricks, or a mix. Retailers and brand-builders cannot overlook this phenomenon and clearly many brands have now embraced this online world in one way or another. More and more brands are working to optimize their online presence, protect their brand equity and drive profitable e-commerce sales growth. With only a few days to go before the shopping frenzy of Black Friday 2015, new research suggests retailers could expect spending to double this year compared to last year. Here in the UK, experts are predicting that Black Friday 2015 could be the UK’s first ever £1bn online shopping day. Mobile transactions are also set to soar, as nearly one in three shoppers are now making their purchases on mobile devices. This sounds all very positive, but it is not all good news. Here are some recent news stories which highlight one of the major challenges facing e-commerce and people wishing to purchase goods online. Prior to the recent World Rugby Cup in England, the City of London police investigated the production and sale of counterfeit Rugby World Cup tickets, with a number of fans being ripped off by fake websites. In 2015, the UK’s Medicines and Healthcare products Regulatory Agency (MHRA) announced that they had seized dangerous counterfeit and unlicensed medicines worth nearly £16m. Slimming pills, drugs for erectile dysfunction and cancer medicines were taken in a series of raids. Nearly 1,400 websites were closed as part of the operation. The seizures were part of Operation Pangea – an international clampdown on the illegal trade in fake medicines by 115 countries. BLACK Friday bargain hunters here in the UK are set to be scammed out of hundreds of thousands of pounds through ‘fake’ retailer websites set up by cyber criminals, experts have warned. Criminals are going to great lengths to produce sophisticated but fake websites that offer the most popular items at unbeatable prices. Two thousand websites selling fake luxury goods have been removed since the start of 2015, UK police say. Counterfeit goods from brands such as Burberry, Longchamp and Abercrombie & Fitch were among the products offered. The raids were the result of a collaboration between brand-protection groups and internet registries. The Police Intellectual Property Crime Unit, run by City of London Police, also warned many of these fake websites were also harbouring malicious software. Although these stories above were published here in the UK, similar examples exist in most other jurisdictions. Counterfeit goods can include fake designer clothes, bags, watches, accessories and perfumes as well as pirate DVDs, CDs, smartphones and computer games. They can also include medicines and components of automobiles and aircraft. Many counterfeit goods are sold at car boot sales, pubs, markets or fairs. This makes it extremely difficult to trace the fraudster once a customer has purchased the item. The size of the problem posed by counterfeiters is staggering. According to FBI, Interpol, World Customs Organization and International Chamber of Commerce estimates, roughly 7-8% of world trade every year is in counterfeit goods. That is the equivalent of as much as $512 billion in global lost sales. IP theft poses a risk to all industry sectors; those most commonly affected by IP theft are manufacturing, consumer goods, technology, software, and biotechnology, including pharmaceuticals. The counterfeiters have also taken note of the growth of the online world and have adapted their approach accordingly. Many counterfeit goods are now sold online. Counterfeiters create fake websites that mimic the ‘look and feel’ of the genuine brand’s own web site. Some fake websites can be used by scammers to trick consumers into paying for goods that will never arrive, and also to harvest the consumer’s credit card and bank details. These fake sites can look very convincing, and it may be difficult to spot any differences between them and the real thing. Send a notice to the ISP hosting the website and request the website to be taken down based on it infringing the brands copyright/trademark. Contact the payment provider used by the website and request the payment facility is withdrawn on the grounds that the products being sold are counterfeit and contra to their terms and conditions. If the website’s domain name contains the trademark of the brand then it may be possible to reclaim the domain name through the UDRP process. When the website is built on the ecommerce platform of a third party it is possible to request the ecommerce platform provider to turn off access to the website on the grounds of illegal activity. The growth of e-marketplaces has also helped the counterfeiters as many sell their counterfeit good using these platforms. An e-marketplace is a type of e-commerce site where product or service information is provided by multiple third parties, whereas transactions are processed by the marketplace operator. In an e-marketplace, consumer transactions are processed by the marketplace operator and then delivered and fulfilled by the participating retailers or wholesalers. Other capabilities might include auctioning (forward or reverse), catalogs, ordering, wanted advertisement, trading exchange functionality and capabilities like RFQ, RFI or RFP. In general, because e-marketplaces aggregate products from a wide array of providers, selection is usually wider, availability is higher, and prices are more competitive than in vendor-specific online retail stores. In recent years, there has been tremendous growth in e-marketplaces. There are many different types of e-marketplace based on a range of business models with some estimating that there are almost one thousand such e-marketplaces in existence today. They can be broadly divided into categories based on the way in which they are operated. 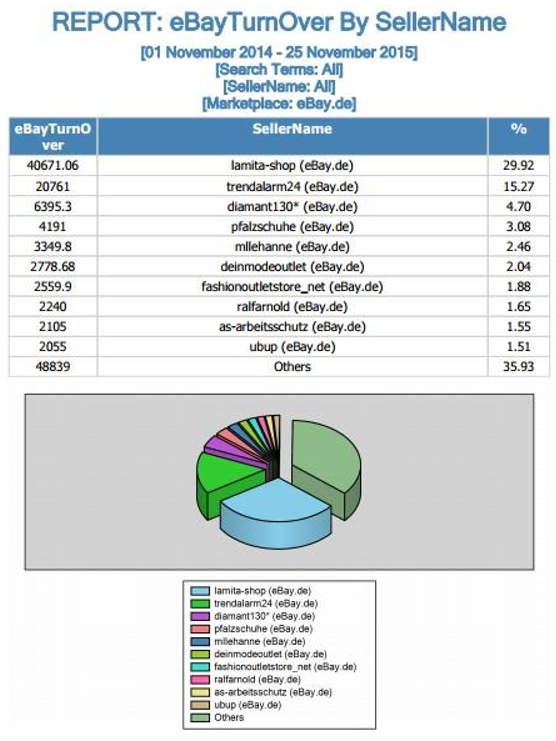 Examples of some online marketplaces are Amazon.com, Alibaba, eBay, and etsy. Removing infringing listings from online marketplaces is fairly straight forward on sites such as eBay and Amazon. Certain China based sites such as Alibaba, Aliexpress and Taobao have online portals that you can submit listing takedown requests. Unfortunately, there are also some marketplaces such as tootoo.com that do not provide any obvious method for requesting a takedown. In these cases you have to resort to instructing a local law firm to issue takedown notices which is costly and time consuming. Social media platforms are websites and applications that enable users to create and share content or to participate in social networking. Websites and applications dedicated to forums, microblogging, social networking, social bookmarking, social curation, and wikis are among the different types of social media. Facebook, Twitter, LinkedIn, Wikipedia and Pinterest are some of the most popular. However, social media platforms are also being leveraged by the counterfeiters, with many establishing private groups on such platform to link sellers and buyers together. Infringements on social media come in broadly two areas. The first are profiles or accounts that have been registered containing a trademark. Removal of these accounts can be done using the IP reporting tools provided by Facebook, Twitter etc. The second area is users offering for sale counterfeit products through their accounts or in the case of Facebook in groups. Taking action against people offering counterfeit products for sale on social media is largely left to brands. Social media sites tend not to be interested in tackling this issue. The scourge of counterfeiters utilizing this online world needs to be tackled but that is easier said than done. Brand Protection Managers or those tasked to help and support such Brand Protection Managers face a challenge tackling this scourge. Some Brand Protection Managers are in denial, believing that counterfeit products are not an issue for their particular companies, rather it is a problem which adversely impacts only others. Some Brand Protection Managers acknowledge that counterfeit products exist, but believe that only an insignificant percentage of their products are counterfeit and that such type products in the marketplace may actually enhance their brand to some degree. Some Brand Protection Managers accept that they do have a major issue with counterfeit products but believe that the problem is so big that it is impossible to do anything about it. They have given up without a fight, accepting that the problem of counterfeit products is just part of ‘doing business’. Some Brand Protection Managers do wish to try to address the counterfeit problem but are unsure where and how to start. They lack a fit for purpose process to follow, to help them go through the key phases in online brand protection or they lack data to guide them in making informed decisions about what to do. Many Brand Protection Management functions within companies are not well resourced either in terms of people or money, and such functions are under intense pressure to do more with less. However, some Brand Protection Managers have adopted good practices, and have commercial and professional procedures in place that are efficient and effective. The methods or techniques these Brand Protection Managers have adopted consistently show superior results in their fight against the counterfeiters online. The fight against counterfeits online starts offline. Primarily counterfeit products are bought on Chinese marketplaces and then shipped to the EU or US via courier. The goods are then sold on local marketplaces such as eBay, Gumtree, Craigslist and Amazon. Increasingly they are also being offered for sale via posts on social media in particular Facebook. To try to stop the movement of goods from China the following things need to be in place. Make sure trademarks are registered in the jurisdictions that you trade. Register domain names covering your trademarks plus associated products to reduce the chance of the counterfeiter doing it for you. Register your trademark with customs in China and the EU and US so that you can have counterfeit versions of goods seized. Put in place a customs training program and deliver it on a regular basis to customs officials to ensure you are top of mind. It is important to adopt a zero tolerance approach giving a seizure of five items the same level of importance as five hundred. Customs officials take a dim view of brands that ignore their requests to cooperate with a seizure only to be told it is too small for the brand to do anything about it. Online marketplaces, search engine results and social media should be monitored on a regular basis and infringements acted on quickly. Allowing infringing listings to go un-actioned will invite more counterfeiters because they feel they can operate online with little interference. Monitoring and measuring the activities of the counterfeiters is crucial. Having good quality data allows the Brand Protection Manager to make informed decisions, and to utilize their limited resources efficiently and effectively. Brand Protection Managers should realize that they are not alone in this fight against counterfeiters. Depending on their jurisdiction and business sector, there may be good help and support available from their industry association, from special IP focused units within the Police, from Customs and from Trading Standards or their equivalent. Many brands benefit from being members of their local anti-counterfeiting group. In the UK that is ACG, the US IACC, France UNIFAB and Germany APM. They hold networking events and arrange for brands to meet and train law enforcement officers. These events are opportunities to share intelligence and views on brand protection matters. Some anti-counterfeiting groups such as ACG in the UK coordinate raid action against counterfeiters where a number of brands are involved. Technology can also assist the Brand Protection Manager. One of the most effective ways to keep on top of online counterfeit sales is to invest in an online brand protections solution. It enables the brand to be much more productive. Multiple listings can be removed at a click of a button. Reports that might take hours to produce manually can be generated in a matter of minutes. Counterfeiting is not a victimless crime. While such products they may look like the genuine article, they can often be dangerous. Over the past 12 months, Trading Standards officers in Birmingham in the UK seized nearly 15,000 fake items worth more than £111,200, ranging exploding phone chargers, fake UGG boots, poor quality designer clothes and fake cigarettes and alcohol. Produced cheaply, counterfeit goods often fail to meet safety standards and have shorter lifespans than legitimate products. Missing and poor quality components in counterfeit electrical goods, such as phone chargers, can lead to electric shocks, fires and explosions, while fake children’s toys and clothes can pose hazards through dangerous small parts, long cords or from toxic materials. Counterfeit cosmetics may contain toxic ingredients like arsenic, lead and mercury which can lead to rashes, swelling or poisoning, while fake alcohol may be mixed with substances like methanol or anti-freeze which can also cause health problems. As well as being potentially dangerous to consumers, traders selling counterfeit goods are also harming the local economy, undermining legitimate retail businesses and traders, who support the economy and provide genuine jobs for people. It is still cool to tell your mates about the counterfeit Rolex watch you bought on holiday. Not so cool though when it has been shown that the trade in counterfeit products funds drugs, arms used by terrorists and slave labour. Online brand protection against the scourge of counterfeiters is a major challenge for many Brand Protection Managers, but it is not impossible. By understanding best practices in this area, by putting a robust fit for purpose process in place, by underpinning that process with a creative and innovative technology platform, by establishing a network of contacts in the industry, with the Police, with Customs and Trading Standards, and by appreciating how the counterfeiters are themselves embracing the online world, then Brand Protection Managers give themselves a fighting chance of winning. Although they are criminals, the counterfeiters are very creative and innovative. It is therefore imperative that the Brand Protection Managers or those tasked to help and support the Brand Protection Managers are even more creative and innovative. They need to step into the shoes of the counterfeiters and really understand how they are utilizing this online world to their advantage. It is only then that strategies can be developed, and action plans implemented to tackle this scourge. The counterfeiters are using the amazing technology of the online world. Brand Protection Managers would be foolish not to do likewise and leverage the power of the internet. Screen shots included in this paper are taken from Brandstrike’s IP Curator system, a creative and innovative solution to help Brands tackle the scourge of online counterfeit goods. « How much do you REALLY need to raise on Kickstarter or IndieGogo?